(“Art Area: May 8 , 11 pm, $15 admission, Area, 157 Hudson Street, NYC”). 1985. 8 x 10”. Photo: “Michael Halsband at Mr. Chow’s.” Lithograph on card stock. 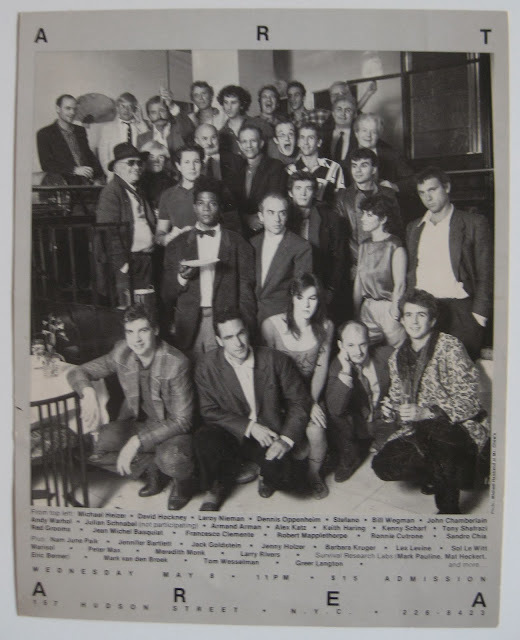 The 1980’s answer, perhaps, to the 1951 photograph of “The Irascibles” appearing in Life magazine, Michael Halsband’s decade-defining image of New York artists is printed here in its original reception context: a vintage invitation to the nightclub, Area, on May 8, 1985. Area was recently chronicled by the New York Times as “the nightclub-as-art-gallery that came to define the creative hedonism of 1980s New York.” Apart from this, Basquiat, wearing a bow-tie in the group portrait, wryly marks his own place within the matrix of race, class, and power in the 1980s artworld: as the only black man in the photo, he holds a plate, posing as a server. Printed in an unknown edition size. Every picture tells a story.